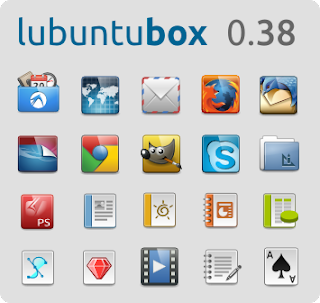 The Lubuntu icon theme called "Box", that was introduced with Lubuntu 12.10, has reached version 0.38, getting many new and improved icons. To celebrate the 0.38 release, an article on the Lubuntu blog links to the latest Box Icon Theme 0.38 so you can download and use it on any Linux system. To use it, extract the downloaded archive and copy it to ~/.icons (".icons" is a hidden folder in your home directory so press CTRL + H to be able to see hidden folders; if this folder doesn't exist, create it). To change the icon theme to Box under Unity / GNOME Shell, use a tool such as GNOME Tweak Tool, Unity Tweak Tool, Ubuntu Tweak, Unsettings and so on to change the icon theme.